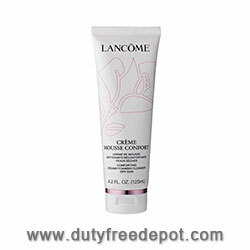 Rich and gentle, Lancôme Crème Mousse Comfort creamy cleanser delivers a voluptuous foam that melts away makeup, even waterproof, and dissolves impurities. Its instantly comforting formula enriched with nourishing Rosehip Oil and soothing Rose de France cleanses skin leaving it soft, supple and satiny-smooth. Lancôme Crème Mousse Comfort leaves your skin radiant, soft and smooth, with a strengthened moisture barrier to preserve it from dryness.